The holiday season can evoke many different emotions—from feelings of nostalgia and togetherness to downright frenzy. The holiday season offers businesses an opportunity to cut through the clutter and reach out to current and potential customers in a meaningful way that will enable you to stay top of mind with a marketing approach that gets results. There are numerous benefits to businesses implementing a multi-channel marketing campaign, which is the execution of a single strategy across multiple channels or platforms, especially during the holidays. This approach maximizes opportunities for businesses to interact with current or prospective customers, with a consistent brand message that is magnified because you can disperse it multiple ways. According to Business to Community, which cites a CMO by Adobe survey, 50 percent of multi-channel marketers say they “usually” or “always” hit their financial targets. Think about how you can incorporate these print and digital channels into your marketing mix during the holidays. The marketing funnel can start with a direct mail campaign. One of the most important components to an effective campaign is having a targeted list that includes the most up-to-date contacts and information. The list should be updated, on a constant basis, as well as be tiered based on how and what you want to communicate. The other critical factor is to create an eye-catching, festive and creative marketing piece, which encompasses your key messages, branding and a call to action. It also should be easily adaptable for digital and social media channels. Next, you can reach your target audiences through digital channels including email. There are many benefits to utilizing email in the marketing mix. Emails go directly to the intended user and can be shared easily and quickly. The user also can take action through email and contact you, if interested. The email could bring the user to an interactive landing page, so the marketing piece can be viewed electronically. This page also presents an opportunity to engage in conversation and/or collect information for future marketing efforts. Finally, you can unveil your marketing piece through your social media channels. Social media platforms like Facebook, Instagram, Twitter and LinkedIn enable information sharing among groups with the same interests. You also can reach a larger audience, as well as capitalize on shares, likes, hashtags and interactivity. Each channel has a different voice, audience and messaging. As such, highlight the different aspects of your marketing piece based on the social channel. Facebook and Instagram are image driven, while Twitter is more hashtag dominant. LinkedIn is different in that it has more of a business focus. After distributing your holiday marketing piece through these channels, you can conduct personal follow ups to engage in conversation, which can move a potential customer further up the sales funnel. An example of a successful multi-channel marketing campaign is our company’s annual holiday card, which is scheduled for distribution this month. Creative Marketing Alliance (CMA) has been creating its uniquely branded holiday card for more than 25 years. 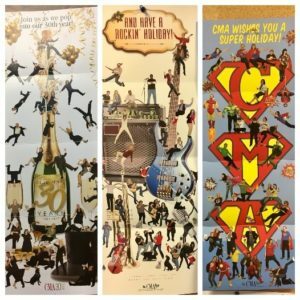 There’s a different theme each year, which has included a champagne pop to celebrate its 30th anniversary, superheroes, rock n’ roll and the CMA Crew’s favorite holiday ornaments. Fun photos of the firm’s employees are interspersed throughout the design. The combination of creativity and people reinforces CMA’s branding and corporate culture. In addition to mailing the card, CMA also produces a digital version that people can interact and engage with on their desktop. Each year, it’s essential to keep the digital execution of the card interesting and dynamic, such as producing a platform where people can be a part of the conversation. CMA’s clients, prospects and friends look forward to seeing it, which has resulted in an increasingly higher response rate. A successful multi-channel marketing campaign requires strategy, time and resources. To help overcome the marketing challenges during the holiday season, businesses should strongly consider implementing this type of campaign. Doing this will help you cut through the holiday clutter and connect with your contacts in a more personalized and emotional way. Kelsey Brooks is a marketing associate at Creative Marketing Alliance. To ensure that you are successfully managing your brand, it would benefit you to work with professionals who are experts in marketing. CMA can help! Contact us at 800.852.4269 or email us at info@cmasolutions.com.